Nathan Collins and Martyn Bunce. Skegness Town will be looking to end their losing streak on the road when they travel to Swallownest on Saturday. 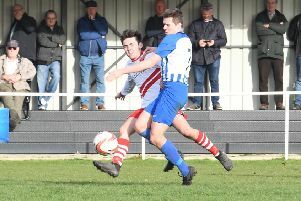 Following three away defeats in a row, in which they’ve failed to find the target, the Lilywhites are hoping for better at the Miners Welfare Ground. Swallownest left the Vertigo Stadium with a 2-0 victory in September courtsey of Alex Lill’s brace. They currently sit 10th in the Northern Counties East League Division One, four places and four points above Martyn Bunce and Nathan Collins’s Skegness side.